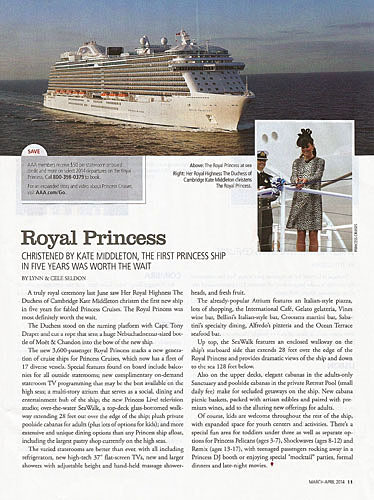 A truly royal ceremony last June saw Her Royal Highness The Duchess of Cambridge Kate Middleton christen the first new ship in five years for fabled Princess Cruises. The Royal Princess was most definitely worth the wait. The Duchess stood on the naming platform with Captain Tony Draper and cut a rope that sent a huge Nebuchadnezzar-sized bottle of Moet & Chandon into the bow of the new ship. The new 3,600-passenger Royal Princess marks a new generation of cruise ships for Princess Cruises, which now has a fleet of 17 diverse vessels. Special features found on board include balconies for all outside staterooms; new complimentary on-demand stateroom TV programming that may be the best available on the high seas; a multi-story atrium that serves as a social, dining, and entertainment hub of the ship; the new Princess Live! television studio; over-the-water SeaWalk, a top-deck glass-bottomed walkway extending 28 feet out over the edge of the ship; plush private poolside cabanas for adults (plus lots of options for kids); and more extensive and unique dining options than any Princess ship afloat, including the largest pastry shop currently on the high seas. The varied staterooms are better than ever, with all including refrigerators, new high-tech 37" flat screen TVs, new and larger showers with adjustable height and hand-held massage shower heads, and fresh fruit. The already-popular Atrium features an Italian-style piazza, lots of shopping, the International Café, Gelato gelateria, Vines wine bar, Bellini's Italian-style bar, Crooners martini bar, Sabatini's specialty dining, Alfredo's pizzeria and the Ocean Terrace seafood bar. Up top, the SeaWalk features an enclosed walkway on the ship's starboard side that extends 28 feet over the edge of the Royal Princess and provides dramatic views of the ship and down to the sea 128 feet below. Also on the upper decks, elegant cabanas in the adults-only Sanctuary and poolside cabanas in the private Retreat Pool (small daily fee) make for secluded getaways on the ship. New cabana picnic baskets, packed with artisan edibles and paired with premium wines, add to the alluring new offerings for adults. Of course, kids are welcome throughout the rest of the ship, with expanded space for youth centers and activities. There's a special fun area for toddlers under three as well as separate options for Princess Pelicans (ages 3-7), Shockwaves (ages 8-12), and Remix (ages 13-17), with teenaged passengers rocking away in a Princess DJ booth or enjoying special "mocktail" parties, formal dinners, and late-night movies.